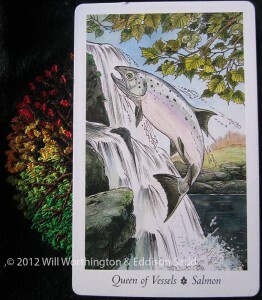 This week, after the busy events of last week, we have the wonderful and wise Salmon offer us some nuggets of wisdom. Oh boy, it’s hard to be wise at the time, to say the right thing at the right time. The Salmon, to me, is about trying and never giving up, but the Salmon is also wise. Probably because of the hazel nuts they ate that dropped into the water. The Queen is generally a mature lady, one who is able to show great honesty, generosity and in this case, self-sacrifice. I have to ask, which nuggets of wisdom does she want to part with this week? The Queen can be tender-hearted, kind. Do you need to be kind and tender-hearted to others this week? We forget, when we’re wrapped up in our own things, that others don’t know what is going on in our heads. We need to keep in mind that others aren’t in our heads, feeling our angst or frustrations. We shouldn’t take it our frustrations out on those we call friends or on family. Friends, if they’re special enough, will forgive us, but why ask them to in the first place? Family don’t need to put up with it either, they can’t always leave the house and escape your foul mood. I feel the role this week, of the Queen of Vessels, is to be the one offering comfort. There’s a nugget of wisdom. Not, to the extend of the self-sacrificing nature the Salmon has, but certainly to offer comfort and to call on your own intuition. Are you being too harsh on yourself? Are you being a bear with a sore head? Could you do with just taking a breath and remember that others are human (with feelings) too? It’s time to act with some emotional maturity, not taking on others projections and impressions, but living your own life, in an emotional responsible way. Take care this week and thanks again for stopping by! I’ve used The Wildwood Tarot and I hope you’ve enjoyed my nuggets of wisdom, as they’ve come from the Queen of Vessels. It is a wise advise indeed. I tend to slash out to the ones I love the most when I feel irritated or anxious. Thanks for reminding me to take a breath and act in a more mature way. I certainly needed this reminder this week! It has been a slightly stressful couple of weeks, with me largely alone with 2 small children (and the dog), and yes, I found myself taking it out on those who were least able to defend themselves. Luckily I was able to reign myself in and step away from the situations when they happened, but I still felt bad about it. Thank goddess for the unquestioning love and forgiveness of our children. We can certainly learn a few things from them and their unclouded minds (and I am learning every day).